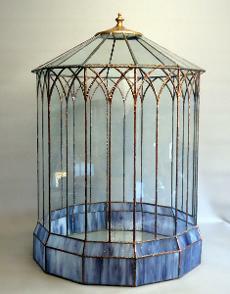 Alan has been working with stained glass for over 20 years. 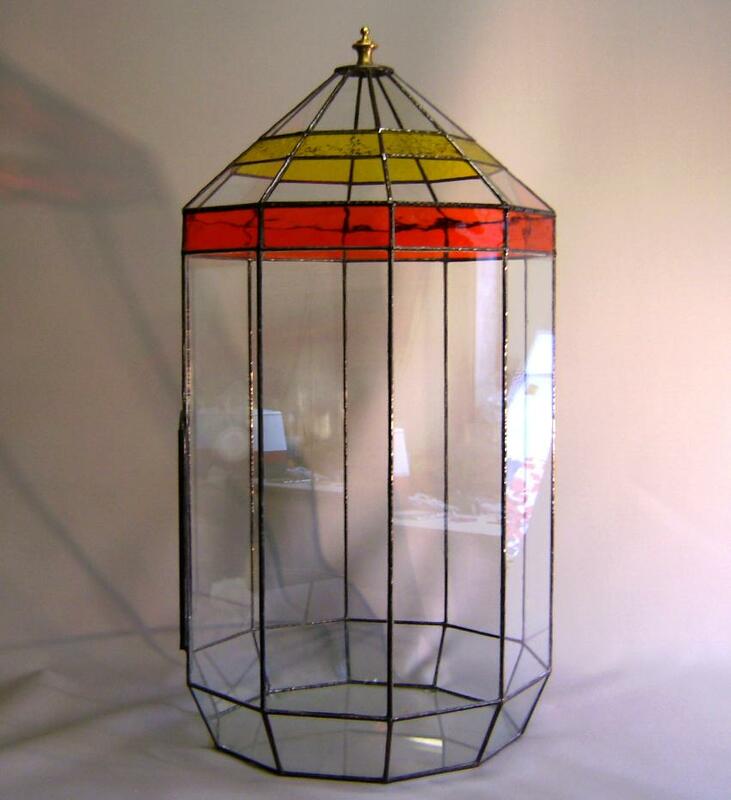 Initially he took an evening class after developing an interest in stained glass and it's creative possibilities. From this he progressed to working with his instructor and her partner, usually, but not exclusively, on church windows. This work often involved the removal of whole windows and their transport to the studio where cleaning, repairing the lead surrounds and replacing broken panels was carried out. After this Alan started to create a variety of different pieces to his own design, including decorative boxes for jewellery and other small items, mirrors, sun catchers, tea light holders, planters for herbs etc and decorations for a variety of different occasions such as Christmas, Easter and Valentines day. Alan has a long background in construction and decided that he wanted to design and construct even bigger pieces than he has so far made. This led to an interest in Wardian cases. A chance remark he read, made by someone, about the impossibility of making these structures any bigger than 30/40 cms he has embarked on creating ever larger terrariums. What is a wardian case? 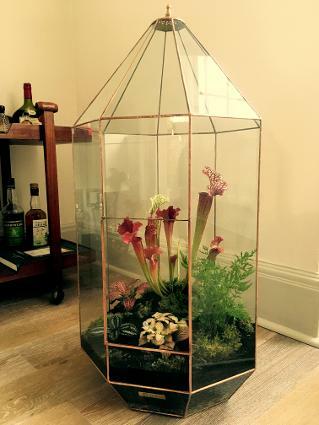 A Wardian case, also known as a terrarium, is essentially a miniature world – one that the owner can create themselves. They can be made in a variety of sizes to suit individual needs. It might be a tiny rainforest with lush foliage and bright flowers, or a desert with succulents planted among colourful stones or a Victorian fernery, or a minimalist composition with just one special plant. Conversely it may not contain any plants at all. It may contain crystals, feathers,, bones, seashells, pieces of wood, porcelain trinkets - anything that catches the owners imagination and helps create a mood or a look. It may contain items that are very special and that create a very beautiful memory box. An added bonus is that once planted they require very little work to maintain them. A planting and care guide is enclosed with each one sold! National Trust in 2016 for their gardens in the N.W highlands of Scotland for sub-tropical plants. base, it protects the plants and still allows them to take nutrients from the earth. A lttle bit of History! 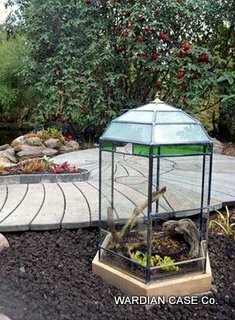 The Wardian case was an early type of sealed protective container for plants used in the 19th Century to protect plants brought into the UK from abroad as the majority of them died on long sea journeys. 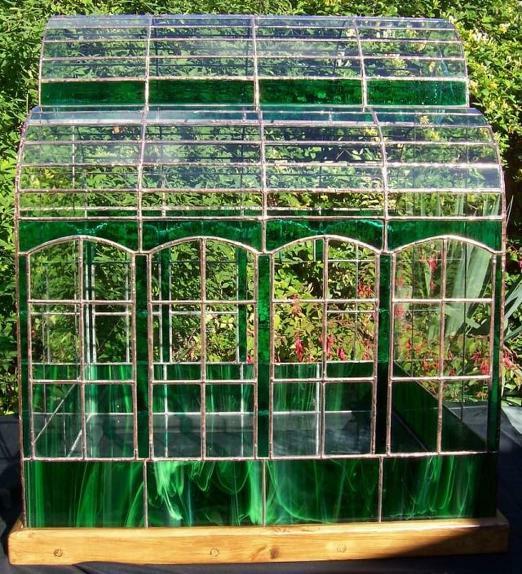 The Wardian case is the direct forerunner of the modern terrarium and was developed by Dr Nathaniel Bagshaw Ward (1791 – 1868) in London in about 1829 when he found that many of his plant collection was not surviving the extremely polluted London air. A fern spore that had been kept in a sealed bottle started to germinate and continued to grow for 4 years, dying only when the seal rusted and exposed the plants to the air. Alan uses photographs, patterns and his own creativity as inspiration for his varied designs. He has used the original Crystal Palace and the Orangery at Kew Gardens to name but 2 buildings on which he has based completed Wardian cases. Any design and size can be discussed with him should a client wish to commission a particular piece. Once a design has been decided on, a pattern is created and for the larger pieces, e.g. Crystal Palace, supports are made to hold the more complex parts of the structure such as a domed roof for example. The glass required (both coloured and plain, as appropriate for the design and for needs of the client) is then cut to the shapes needed and the edges of each piece ground. Re cycled glass is used where possible. Each individual piece is then copper foiled and soldered together to create the shapes needed. On occasions, as is required by the design, pieces are leaded together as is seen in stained glass windows – it should be noted, however, that this adds to the weight of the structure. Working this way ensures that someone who commissions a Wardian case gets a piece that is unique and that matches the colour choices of the individual.